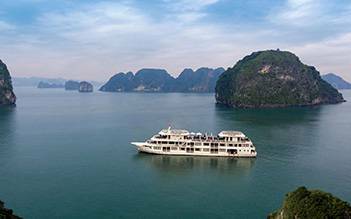 The Rosa Cruise proudly offers the new premier cruise experiences in Halong Bay which combines the most modern and greatest comfort. Wishing to provide customers the best culinary and premium cruise experiences. 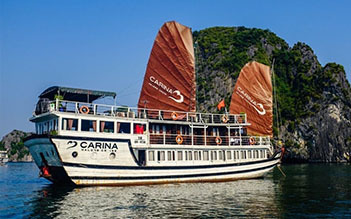 With 2-day cruise tour, you will join an interesting itinerary : floating fishing village - pearl farm - Amazing Cave and some exciting activities are waiting for you. 15-30 days before arrival: 10% of total tour price. 7-15 days before arrival: 50% of total tour price. 4-7 days before arrival: 75% of total tour price. Within 3 days before arrival: 100% tour price. There will be no refund given for any unused or missed ground arrangements, sightseeing, meals or hotel accommodations. For no show cases, there will be no refund. Under 4 years: Free of Charge. From 4 to under 8 years old: 50% of adult's fare and sharing bed with parents. Over 8 years old: 100% of adult's fare and using his own bed. 07:30 – 08:30: Optional shuttle bus pick you up at your hotel in Hanoi old quarter. 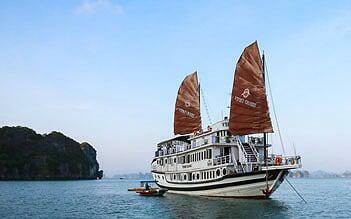 08:30: Departure to Halong Bay for 3.5 Hours. 10:00: Arrive in Hai Duong province, and have 20 minute short break. 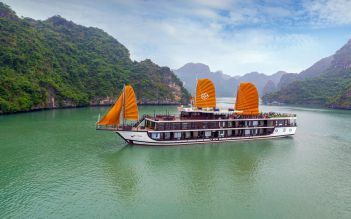 12:30: Enjoy Vietnamese seafood and vegetarian lunch, while cruising in the magnificent Halong Bay, admiring the fascinating rock formations in the bay. 17.30: Come back to our Rosa Cruise and relax. 19:30: Time for dinner enjoying special foodon the cruise. 21:00: Evening entertainments: play game on the cruise: cards game, chess, karaoke, squid fishing, and overnight on the Rosa Cruise. 06.30: Early morning sun risers can enjoy Tai Chi lesson on sundeck. 07.00: Morning view of bay’s landscape with a cup of tea or coffee. Have breakfast. 08:00: Arrive Sung Sot Cave (Amazing Cave) and joining with guide to visiting and explore the cave. 10:00: Check-out and enjoy a fantastic cruise on the bay. 11:00: Enjoy the lunch on cruise. 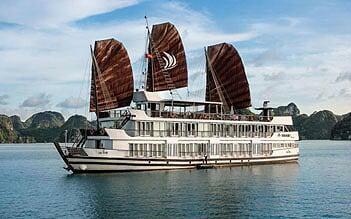 12:00: Rosa Cruise are landing Halong Bay harbor, tourist say goodbye to sailors and finish the cruise. 12:30: Return to Hanoi by shuttle bus. 14:30: Stopover in Hai Duong province to visit a ceramics workshop. 16:00 – 16:30: Arrive in Hanoi end your trip. 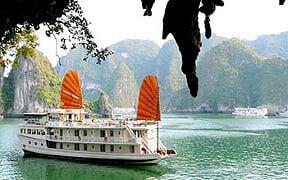 Family trip 2 days 1 night Lovely and amazing family trip we had in Halong bay. All are well organized and arranged by Rosa team. We all had fun and enjoyable time. Nice boat with nice facilities for a good price. We had a double room with sea view and got a very comfy night's sleep. Kayaking and swimming were good fun despite the rain, and life jackets provided when needed. The meals were really tasty and decent sized portions. Thanh was a good host, explained everything well and made people feel relaxed. Would recommend. We are two travellers on our gap year (19 years old). 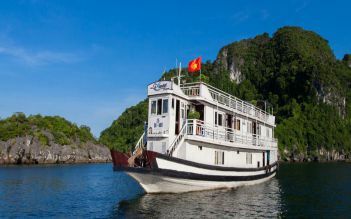 We decided to splash out of our budget on a Halong Bay two day one night tour as it was something we really wanted to see. Our trip with Rosa cruise was completely worth the money and we’re more than satisfied with the cruise. Picked up on time from the hostel by tour guide Harry who was very informative. The drive is 3hrs to the dock but it felt short due to the comfort of the seats - you can sleep easily. All food is provided on the boat (and there’s plenty of it). Activities included kayaking, exploring caves, open sea swimming, fishing, cooking and tai chi! Drinks on the boat were reasonably priced too and the staff were incredible. The rooms are really clean and spacious too - definitely recommend Rosa Cruise to anyone! Harry (our tour guide) went above and beyond and showed us everything there was to see and we really got on with him he gave us many recommendations for the rest of North Vietnam! Thank you Rosa Cruise & Harry!! 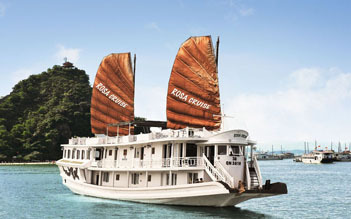 We ended up choosing Rosa Cruise because the boat wasnt too big and we found a good offer. 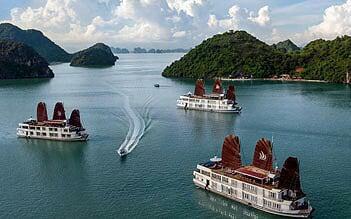 We booked a 2 day and 1 night trip from and to Hanoi. 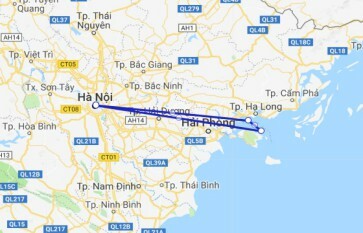 It was basically just one full day in the bay because of the drive from Hanoi (we got to the bay at 12.15 on Saturday and left again on Sunday at 12.15). All meals were included (and we always got plenty of food including always various types of meat and seafood) but drinks except for a few bottles of water during transportation and a welcome drink had to be paid extra (and were quite pricey for Vietnam). The program sounds quite good (visit the oyster farm, kayaking, swimming in the bay on the first day and tai chi, visiting a cave and cooking class (spring rolls) on the next day, but when you look around in the bay all the other boats are doing the same (maybe in a different order and different kayaking spot) If you want to go for 2 days one night I would still recommend a small boat and then choose the one with the best offer. If you need any help, please do not hesitate contact us.